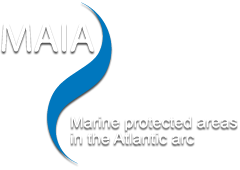 Project funded by the Interreg IV B Atlantic Area programme (2010-2012) whose was leading by the French Marine Protected Areas Agency. Responsible publisher : Christophe AUBEL, General Director of the French Biodiversity Agency. The site belongs exclusively to MAIA. It is a work published by the author for the purposes of the French Intellectual Property Code (Code de la propriété intellectuelle). All rights relating to the site belong to MAIA. This is the case of all the elements used in the development and animation of the site, particularly software, texts, know-how, site structure, navigation principles, ergonomics, design, headings, all contractual items and forms and all other constituent elements of the site. We warmly thank them for their contribution. MAIA grants users a personal, non-exclusive and non-transferable right to use the site. This right does not carry any assignment of any intellectual property rights whatsoever. Any total or partial performance of this site or any content hereof by anyone whatsoever, without the site publisher's express permission, is prohibited and would be an infringement penalised by Articles L.335-2 et seq. of the French Intellectual Property Code. The same applies for any databases featured on the Web site that are protected by Articles L. 341-1 et seq. of the same Code. The distinctive signs of the site publisher, such as domain names, trademarks, company names and the logos featured on the site are protected by the French Intellectual Property Code. Any reproduction in whole or in part of one of these signs using elements from the site without the web site operator's express permission is thus prohibited, within the meaning of the French Intellectual Property Code. The information published is checked on a regular basis. MAIA declines all liability for any errors or omissions. The information posted on line is provided strictly for guidance only. The publisher declines all liability in the event of any loss subsequent to any late update, unauthorised use or technical difficulties. The information published in the file of associations is published under their responsibility. To report a mistake or ask for information to be rectified, please contact the webmaster by telephone or complete the contact form. The technical information on this site is provided for guidance only and may change as a result of amendments to legislation and regulations. MAIA shall not be responsible for your personal interpretation of the information contained in this site. Site users must take all appropriate measures to protect their own data and/or software from possible contamination by viruses on the Internet. Generally speaking, MAIA declines all liability for any loss occurring when visiting this web site. The reproduction of all or part of this site (unless technically required to consult it) on any electronic medium is expressly forbidden. Any person (natural or legal) wishing to create one or more links to one or more page(s) of this site must first inform the site webmaster . The quotation must be short and this notion should be assessed both in relation to the publication from which it is extracted and the one into which it is inserted. The quotation must illustrate a remark and must not compete with the publication from which it is taken. Use of multiple quotations, resulting in an anthology, is considered a derived work, and therefore subject to the prior permission of the author or assign. Reserved and strictly limited reproduction rights. The internet address of the site www.maia-network.org must always be included in the reference. Any use of site content in breach of these requirements shall constitute an infringement within the meaning of Article 335-2 of the French intellectual property code. In addition to civil liability damages, such an infringement may be punished by a ?300,000 fine and/or a 3-year prison sentence. MAIA shall not be liable for links created by other sites to its own web sites. The existence of any such links shall not infer that MAIA approves of these sites or the content thereof. To guarantee the identity and integrity of its site, MAIA reserves the right to prohibit links that do not meet the purpose of the said site or which could be detrimental to the organisation's image. Links to other Web sites featured on this site are provided solely to give you as much information as possible. www.maia-network.org has checked the page to which the active link leads but it does not check, nor is it responsible for these sites or their content. We therefore decline all liability in respect of these sites or the information, software or other documents they contain, and in respect of the consequences of using them. Links to an online simulation service: users should be aware that simulations are not binding on the MAIA network. If you decide to access external sites linked to our site, you do so entirely on your own responsibility. Users of this site should take all appropriate precautions to protect their own data and/or software from contamination by any viruses on the Internet. www.maia-network.org shall not be held liable for any direct or consequential loss caused by use of this web site or other sites linked to it, particularly owing to non-access to the site, malfunctioning of the Internet, the site hoster or the hoster of a part of the site, or a suspension of service for maintenance or updating. No personal information is collected without you knowing it, nor transferred to any third parties or used for purposes other than those indicated. The information you are asked to provide when registering for site publications and newsletters is essential to access these documents. Registrations, answers to forms and comments are only intended for the MAIA network coordination team which you may contact in order to exercise your rights to access and rectify your personal data. All information saved is solely for use by the relevant department (s) and may only be disclosed to the following recipients: Departments and Authorities of the relevant community. No addresses (postal or electronic) may be transferred to any third parties whatsoever or disclosed for purposes not stipulated. In accordance with Article 27 of Law No. 78-17 of 6 January 1978 on data protection, you are entitled to query, access, rectify and raise a legitimate objection concerning all of your personal data by contacting the responsible publisher in the manner required by Article 34 of the aforementioned law. To exercise this right, send an email to MAIA maia@aires-marines.fr or write to MAIA enclosing a copy of an ID document. Users are informed that when visiting the site, a cookie may be automatically installed in their navigation software. A cookie is a data block which does not identify users but saves information relative to their navigation on the site. The configuration of the navigation software provides information about the presence of cookies and it may be refused in the manner described by the CNIL on its web site www.cnil.fr. Refer to the help section of your browser to view the configuration enabling you to inhibit cookies. Pursuant to the French data protection law of 6/01/1978, you are entitled to query, access, rectify and raise a legitimate objection concerning all of your data communicated via cookies. To exercise this right, send an email to contact@maia.com or write to MAIA enclosing a copy of an ID document. Je viens de consulter cette page, http://www.maia-network.org/homepage/legal_notices, je te la conseille.